Accueil > Blog > Actualités > OÉ ALSO TAKES CARE OF GABONESE WOMEN! OÉ ALSO TAKES CARE OF GABONESE WOMEN! OÉ, established in the Gabonese market since 2006, has an undisputed reputation in West Africa and particularly in Gabon. The French brand has managed to challenge key players of the worldwide cosmetics industry being one of the “no miss” actors in the area. Always closer to our consumer, our vocation is to help and support the free and independent Gabonese woman in her daily life. As a kind of “pay back” she elected Our Purple Dream deodorant as the 1st reference in Gabon, all brands combined! 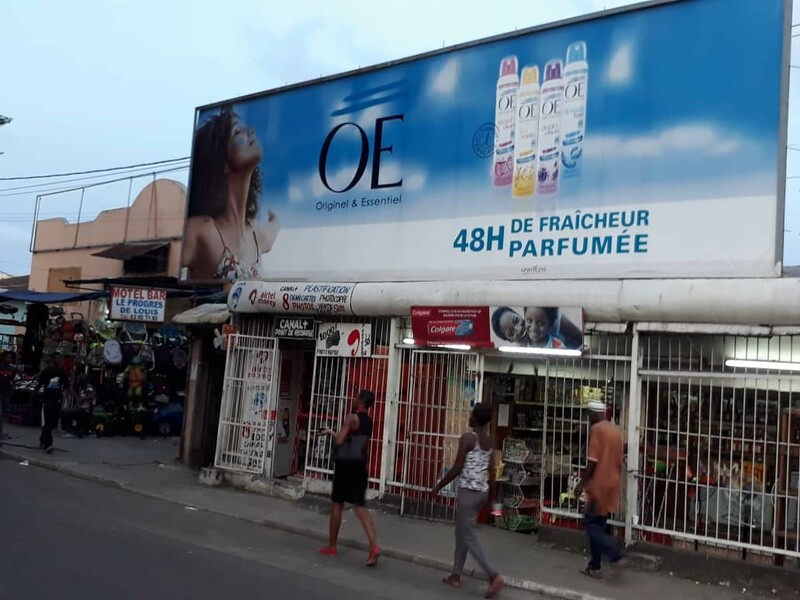 Numerous actions on the territory have illustrated such a close relationship, including a poster campaign in a vibrant area of Libreville: the Louis district. Actually, the campaign displayed our “égérie”, not a celebrity, but a woman to whom consumers can naturally identify themselves. Because OÉ remains the ally of self-confident women without complex.